Panini Grills do something so... yummy to your sandwiches. It takes an ordinary sandwich and makes it special! For this recipe I used Sprouted 100% Whole Grain Bread-Ezekiel 4:9 by Food for Life. Different from most breads today, this unique bread is made from freshly sprouted live grains and contains no flour. Sprouting the bread releases all of the vital nutrients stored in whole grains. It not only significantly increases vitamins, but also causes a natural change that allows the protein and carbohydrates to be assimilated by the body more efficiently. 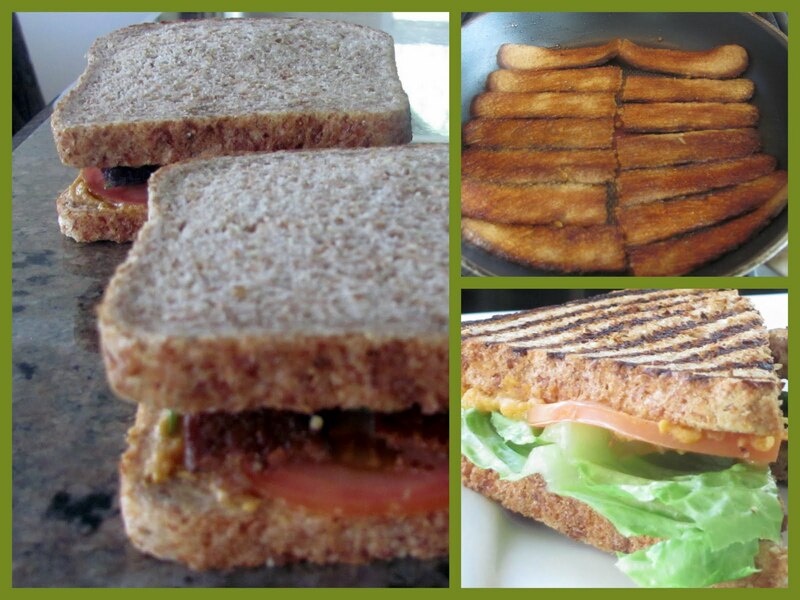 I also used some organic smoky fermented tempeh strips "fakin bakin" by Lightlife. ($1.00 off coupon below). The 2 bread slices give you 8 grams of protein, the 1 1/2 pieces of tempeh strips give you 4 grams and the 2 tablespoons of hummus give you 1 for a total of 13 grams of protein. I spread each piece of bread with 1 tablespoon of jalapeno flavored hummus, added 1 1/2 slices of smoked tempeh strips, sliced tomatoes, fresh basil, mushrooms, fresh jalapenos and after grilling added romaine lettuce. YUMMY! The paninis will cook in a matter of minutes, so watch them carefully. 1.) Cook smoky tempeh strips in pan until lightly crispy. 3.) Cut the 3 long pieces of tempeh in half to equal 6 slices. You will use 3 of these slices for each of your sandwiches. 4.) Spread each piece of bread with 1 tablespoon hummus. Add 3 slices of smoky tempeh to one piece of bread, then 4 slices of tomato, followed by mushrooms, jalapeno & basil. Put the other slice of bread on top of vegetables. Repeat with other sandwich. 5.) 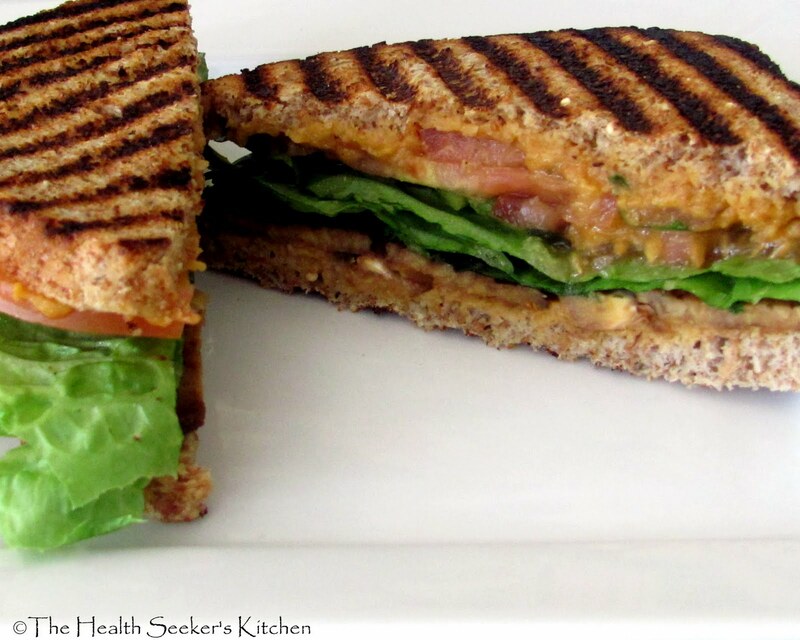 Place sandwiches in panini grill and cook for just a few minutes on medium high. Watch carefully. 6.) After removing panini add fresh romaine lettuce and cut in half. Serve with a big salad or soup. I love this kind offood! I could eat like this for dinner/lunch every single day. And I love tempeh bacon! it makes everything taste so good!!!!! Great sandwich recipe!!!!!! I'd have to make this in the George Foreman cuz a Panini Grill would be like an Ice Cream maker in this house. Thanks for the idea. I have been craving Tempeh. this is great for me as I am trying to fight my dingdong weight problem.